River Valley’s Layne Fitch carries the ball during the Raiders Tri Valley Conference Ohio Division contest against Nelsonville-York on Sep. 14 in Bidwell, Ohio. Last meeting between the teams: Oct. 13, 2017. Wahama won 41-6 in Mercerville. SGHS offense last week: 317 rushing yards, 39 passing yards. WHS offense last week: 1 rushing yard, 110 passing yards. SGHS offensive leaders last week: QB Tristan Saber 4-of-7, 39 yards, 2INTs; RB Kyle Northup 27 carries, 183 yards, 3TDs; WR Jared Ward 1 reception, 22 yards. SGHS defense last week: 424 rushing yards, 72 passing yards. WHS defense last week: 224 rushing yards, 121 passing yards. 1. The White Falcons are 15-2 against SGHS in all-time meetings. South Gallia’s last trip to Bachtel Stadium was on Oct. 14, 2016 and resulted in a 28-20 Rebels victory, their first-ever road win over the White Falcons. 2. South Gallia is coming off of its second-best offensive game of the season. It was the third time SGHS surpassed the 300-yard mark on the ground and the 350-yard mark in total offense. 3. The White Falcons allowed a season-high 44 points in last week’s setback. It was the sixth time a WHS opponent has scored at least 40 points, and the third time in the last four games in which Wahama’s foe has gained at least 440 yards. 4. So far this season, these teams have five common opponents in Southern, Federal Hocking, Belpre, Eastern and Waterford. Both teams defeated FHHS, Wahama by 28 points and South Gallia by 35. The other four teams combined to top Wahama 170-to-22, while defeating SGHS by a 169-to-62 count. 5. Wahama enters Week 8 tied for 36th in the WVSSAC Class A playoff rankings. WHS is tied with Hundred and Greenbrier West, with four other teams in the class with one win. SGHS is 23rd in the OHSAA Region 27 rankings and is one of five teams with one win in the region. Last Week: Rock Hill lost to Ironton 47-13, in Pedro; Gallia Academy defeated Coal Grove 42-20, in Coal Grove. Last meeting between the teams: Oct. 13, 2017. Rock Hill won 56-54 in Pedro. Current head-to-head streak: Rock Hill has won 2 straight. RHHS offense last week: 204 rushing yards, 12 passing yards. GAHS offense last week: 262 rushing yards, 82 passing yards. RHHS offensive leaders last week: QB Brayden Friend 3-of-5, 12 yards, 1INT; RB Logan Hankins 13 carries, 72 yards; WR Zak Adkins 2 receptions, 7 yards. GAHS offensive leaders last week: QB Justin McClelland 8-of-12, 82 yards, 2INTs; RB Lane Pullins 13 carries, 86 yards, 1TD; WR Cade Roberts 6 receptions, 63 yards. RHHS defense last week: 202 rushing yards, 188 passing yards. GAHS defense last week: 153 rushing yards, 145 passing yards. 1. Rock Hill took a 51-13 win in its last trip to Gallipolis. The Blue Devils’ last victory over the Redmen was in a non-conference bout in Gallipolis on Sept. 6, when the GAHS rolled to a 60-2 win. 2. The Blue Devils’ string of four straight wins is their longest in-season streak since 2013. GAHS also completed another four-game winning streak this season, as the Blue and White won their final two games of last fall and the first two of this year. 3. The Blue Devils have more than twice as many rushing yards as their opponents this season. GAHS has held opponents to 869 yards on the ground, while rushing for 2,025. Lane Pullins leads the Gallia Academy rushing attack with 597 yards, followed by Justin McClelland with 478. 4. Gallia Academy has found the end zone 41 times this season, 35 times on the ground, five times via pass and once on a kickoff return. The Blue Devils’ most productive quarter of the year has been the second, in which they’ve scored 90 points. Jacob Campbell’s 11 scores are the most on the team. 5. GAHS enters Week 8 at third in the Region 15 rankings, and is one of three 6-1 squads. St. Clairsville is the lone unbeaten team in Gallia Academy’s region. The Redmen are 18th in the Region 19 rankings, and they’re team in the region with a 2-5 record. Last Week: Vinton County lost to Minford 28-21, in McArthur; River Valley lost to Alexander 10-6, in Albany. Last meeting between the teams: Oct. 13, 2017. Vinton County won 41-13 in McArthur. VCHS offense last week: 180 rushing yards, 154 passing yards. RVHS offense last week: 56 rushing yards, 33 passing yards. VCHS offensive leaders last week: QB Braylon Damron 8-of-20, 156 yards, 1TD, 1INT; RB Cade Sibner 14 carries, 133 yards, 1TD; WR Lincoln Hayes 2 receptions, 93 yards, 1TD. RVHS offensive leaders last week: QB Jordan Burns 4-of-14, 33 yards; RB Trevor Simpson 17 carries, 58 yards; WR Trevor Simpson 1 reception 21 yards. VCHS defense last week: 128 rushing yards, 197 passing yards. RVHS defense last week: 65 rushing yards, 84 passing yards. 1. Prior to last season, Vinton County was 0-3 against River Valley in Tri-Valley Conference Ohio Division play. The Vikings were the last of the league teams to achieve victory over the Raiders. RVHS won 41-6 the last time these teams met in Bidwell, on Oct. 14, 2016. 2. Last week’s four-point margin was the Raiders’ closest game since falling to Meigs by a 38-34 count on Sept. 23, 2016. It’s the only one-possession game in River Valley’s current 10-game skid. Vinton County has dropped five straight decisions, three of which have come by 7-or-fewer points. 3. RVHS has gained a total of 1,155 yards, including 841 on the ground. The Raiders have scored six of their eight offensive touchdowns on the ground. Meanwhile, River Valley’s has allowed 2,305 yards and 33 scores. 4. 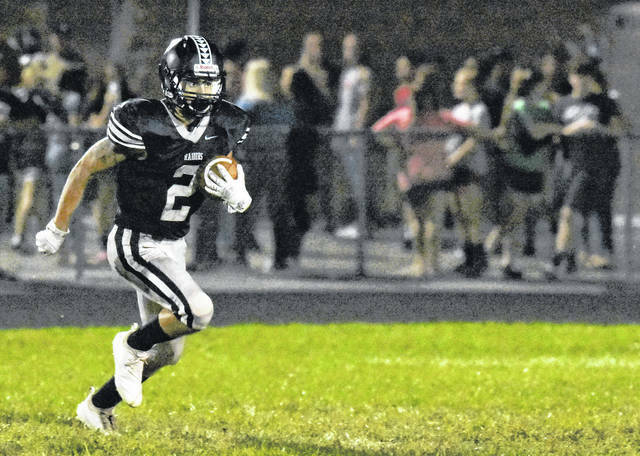 River Valley’s rushing attack has been led by Trevor Simpson and Jared Reese, with 255 and 204 yards respectively. Reese has found the end zone three times this fall, and is the only Raider with multiple touchdowns. 5. The Raiders are one of four winless teams tied at 23rd in the Region 19 rankings. In the Region 15 rankings, Vinton County is 14th and the highest rated of the seven one-win teams.